Twentieth Century Fox Home Entertainment will release an eight-disc box set featuring twenty-six episodes of Tru Calling on May the 9th. The series is about a young college graduate (Buffy The Vampire Slayer's Eliza Dushku) who discovers that she has the ability to re-live a pivotal day in someone's life, and alter their destiny. The set features all twenty episodes of the first season, plus six unaired episodes that were made for the second season, before the series was cancelled. The episodes are presented in 1.78:1 anamorphic format, with Dolby Digital 2.0 audio (not the "5.1" listed by the press release), and optional English HoH subtitles. Bonus features include: commentary tracks (by creator / Executive Producer Jon Harmon Feldman, Executive Producer Dawn Parouse, actors Eliza Dushku, Jason Priestley, Zach Galifianakis and Shawn Reaves); twenty-three deleted scenes (with optional commentary); four featurettes (including Finding The Calling - The Pilot (11m), The Tru Path - Season One (8m) and Evil Comes Calling - A Late Season Twist (7m)); and the Somebody Help Me music video by Full Blown Rose. The set will also feature at least one Easter Egg (click and drag to reveal): Zach Galifianakis audition footage, on Disc Six (3m). The RRP is £39.99. A selection of menu screens from the first six discs in the set can be found here. Warner Home Video will release Jean-Pierre Jeunet's wonderful A Very Long Engagement as a two-disc DVD set on May the 23rd. The Oscar-nominated, Cesar-winning movie, about a young woman (Amelie's Audrey Tautou) who embarks on a journey into no man's land during the Great War, to discover the fate of her fiancé, will be presented in 2.4:1 anamorphic widescreen format, with Dolby Digital 5.1 audio. Details of the bonus features are sketchy, simply "commentary, four documentaries, trailers". (Play.com is more specific, if slightly contradictory: a commentary by Jeunet in French with English subtitles; deleted scenes with optional commentary; The Making of... documentary (75m); Paris in the 1920s featurette (14m); Before The Explosion featurette, about the Zeppelin explosion (14m)). RRP is £19.99. 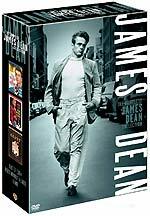 Warner Home Video will release The Complete James Dean Collection on June the 6th. It will feature two-disc editions of the three films he made for the studio, before his untimely death in 1955: Giant, Rebel Without a Cause and East of Eden. East of Eden been digitally-transferred from restored picture and audio elements, and will have a Dolby Digital 5.1 audio mix. 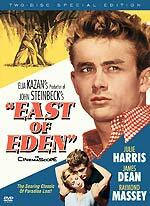 Bonus features include a commentary track (by Richard Schickel); a theatrical trailer; an all-new documentary, East of Eden: Art In Search of Life; the 1988 documentary Forever James Dean; footage from the 1955 New York premiere; screen test footage; wardrobe tests gallery; deleted scenes and set design test footage. 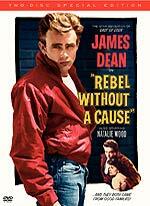 Rebel Without A Cause will feature a commentary track by Douglas L. Rathgeb (author of The Making of Rebel Without a Cause); a theatrical trailer; two documentaries: the all-new Rebel Without a Cause: Defiant Innocents, and James Dean Remembered; three Behind The Cameras segments from the Warner Brother Presents... TV series, featuring Dean, Jim Backus and Natalie Wood, including the infamous Drive Safely public service announcement; screen test footage; wardrobe test footage and deleted scenes (sadly, without sound). 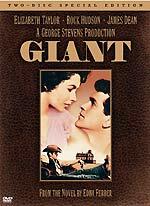 The two-disc edition of Giant was released last year. Bonus features on the disc include a commentary by filmmaker / Stevens family archivist George Stevens Jr., screenwriter Ivan Moffat and critic Stephen Farber; nearly three hours of new and vintage documentaries, including George Stevens: The Filmmakers Who Knew Him, Memories of Giant and Return To Giant; New York premiere TV special; Hollywood premiere and project kick-off featurettes; all-new digital transfer from revitalized picture and audio elements; photo and document galleries; extensive production notes, director filmography and introduction by George Stevens Jr.
Each film will be available separately, with an RRP of £19.99, or in the box set, which has an RRP of £39.99. 2005 marks the 50th anniversary of Dean's death. Amongst other events, the release will coincide with the release of James Dean, an in-depth photographic biography of the star written by George Parry, and published by Dorling Kindersley; the first biography to be authorised by the Dean estate. The second season of the popular US drama series nip / tuck will be released by Warner Home Video on May the 30th. The five-disc set will feature all sixteen episodes of the show's 2004 season (which will air on Channel 4 during the summer). The episodes will be presented in 16:9 widescreen format, with Dolby Digital 2.0 audio. RRP for the set is £49.99. 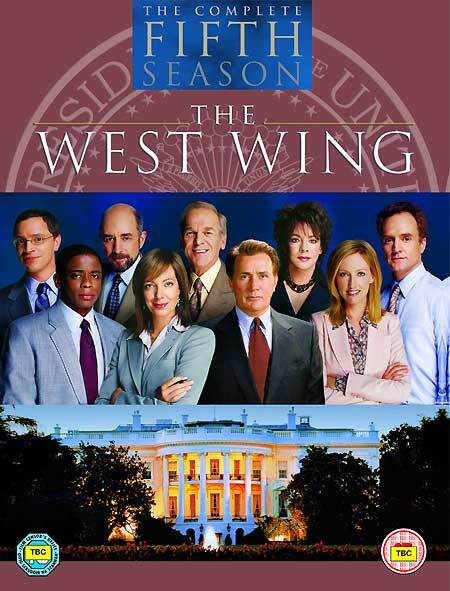 Finally, Warner has released the sleeve art for The West Wing - The Complete Fifth Season DVD set, which is due on April the 25th. I've added a new review to the site today! Contributor Mike Hadfield has reviewed the Sliders - Dual Dimension Edition - The First and Second Series DVD set, which was released here earlier this year (which is when Mike wrote the review - sorry, Mike - like a couple of other reviews I'll be adding this week, it got bumped!) Click here, or on the sleeve, image, right, to read his review. 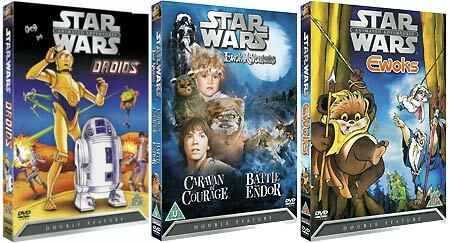 Twentieth Century Fox Home Entertainment will release four Star Wars spin-off DVDs on May the 9th. This collection is led by Genndy Tartakovsky's Emmy award-winning Cartoon Network series The Clone Wars, which takes place between Attack of the Clones and Revenge of the Sith (due in cinemas on May the 19th). 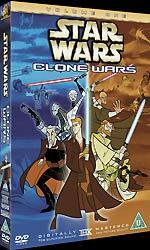 (It does not, as the press release suggests, bridge the gap between the two: there is a second batch of Clone Wars cartoons that aren't on this DVD). The disc will feature all twenty instalments of the first series: nineteen three-minute episodes and one five-minute episode. The series will be presented in anamorphic 1.78:1 widescreen format, with 2.0 Dolby Digital surround audio and English SDH subtitles. Bonus features include a director's commentary; a second director's commentary, called the "hyperspace commentary", Bridging The Saga - Episode III / Clone Wars connections (8m); an EPK (4m); Republic Commando game advert; Revenge of the Sith game advert and teaser trailer (2m); and sketches, storyboards, posters and artwork galleries. Sadly the recent Revenge of the Sith trailer is not included. The RRP is £10.99. No time for anything more than a bare-bones update this morning, I'm afraid. There'll be another update tomorrow. Ceri has added some new titles to the Incoming page, so you might like to digest that along with your cornflakes!